Hello and welcome to the Thistle and That blog! We provide wholesale fresh flowers for brides in the Dallas area who want to DIY their wedding. Just because you are doing-it-yourself doesn’t mean that you can’t have beautiful fresh blooms. Not only can we provide the flowers you need, but we offer classes with David Kimmel our down-to-earth, world-renowned florist who teaches you how to use your selected flowers to make the floral arrangements that you dream of for your wedding. Learn more about our wholesale fresh flowers and classes by visiting our website or stay right here and learn about doing your wedding on budget. It’s easy to think that your wedding has to be on a Saturday when all other weddings are normally scheduled. However, this isn’t the case! Scheduling your wedding during the off-season and during the week, such as a Friday or Sunday can actually save you a lot on venue prices — thousands of dollars! If you pick an off season-day you may be able to afford that venue that you have always dreamed about. If you are worried about your guests not being able to make it, know that as long as you give them enough time to plan, they will make attending your wedding happen. Using catering services or the venue’s alcohol services can seem easy, but buying your own booze will actually save you money. Having an open bar is nice to have, but it isn’t required for your guests to have fun and enjoy partying the night away. Buying a keg, nice boxes of wine, with the fixings for a couple of your favorite cocktails is more than enough and will cost less than an open bar. DIY-ing your wedding decor is one of the best ways to save. Make everything yourself with the help of friends and family, or buy second hand. Buying decor elements from local thrift stores or buying used wedding decor or even renting can save you a lot of money in the long run — and why not? Unless you plan on using your decorations for your home or selling them, they could cost you a pretty penny for just one day of use. A traditional florist can provide you the blooms that you want, but they can quickly put your wedding cost over budget. Instead, buy your flowers from a wholesale fresh flower supplier and put your bouquet and arrangements together yourself! When you do this you still get beautiful blooms, but at a fraction of the cost. DIY-ing your flowers and decor can be an opportunity to spend time with friends and family as they help you assemble the floral and decor elements for your wedding. You don’t have to do it all by yourself! A tiered cake can be a beautiful centerpiece for your wedding, but can also be pricey. Instead of buying a traditional cake, why not buy a smaller two-tiered cake for you and your spouse and serve your guests a delicious alternative. Serve cake pops, cupcakes, or skip cake altogether and provide a dessert bar, cookies, s’mores fixings, or chocolate fondue. We all enjoy wedding cake, but why not mix it up and service something that fits your tastes and your wedding budget? 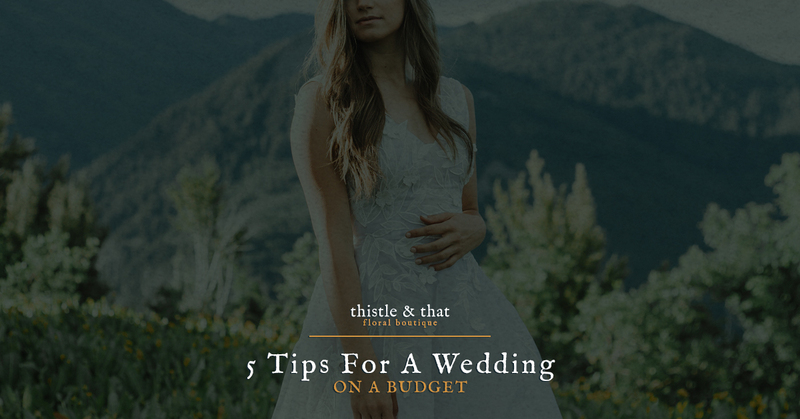 Thistle & That with David Kimmel would love to help you make your dream wedding come true! To learn more about our wholesale fresh flowers and about doing your wedding on budget, visit our website. We offer a variety of beautiful flowers and other decor elements, as well as classes to show you how to make your DIY-decorations.